It has been a while, hasn’t it. 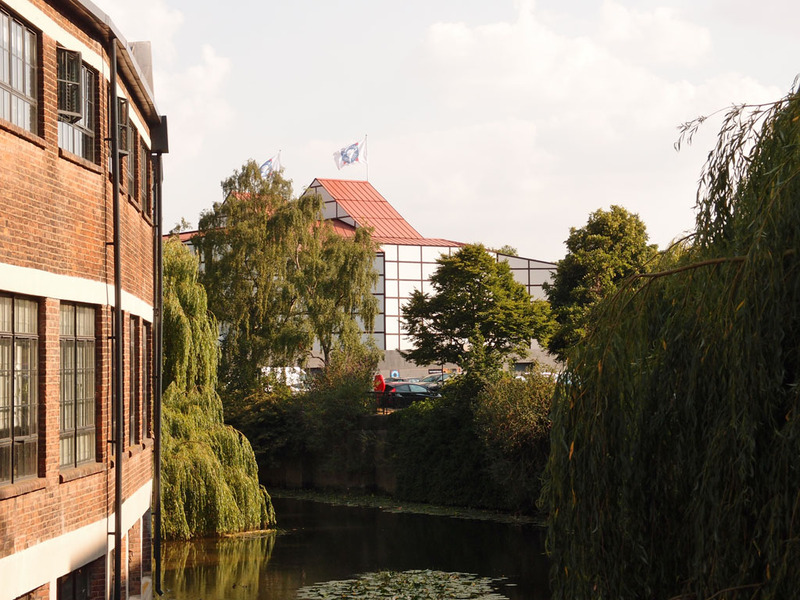 But I can’t let another month go by without an update to this long-running record of York and its changes, so thought I’d share some images and thoughts gathered over recent weeks, during a summer that has been surprisingly hot and sunny for weeks on end. This summer saw the first Bloom! 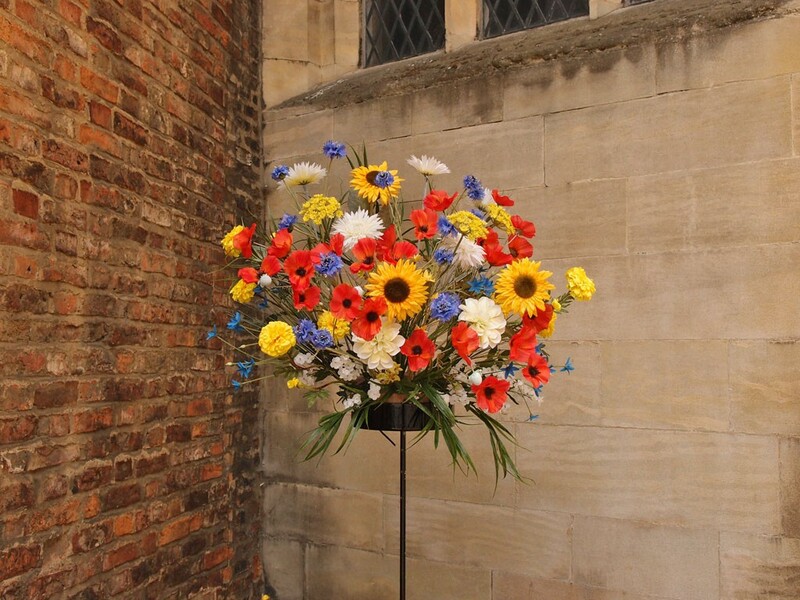 York festival, celebrating all things horticultural, with some fantastic displays of floral loveliness. 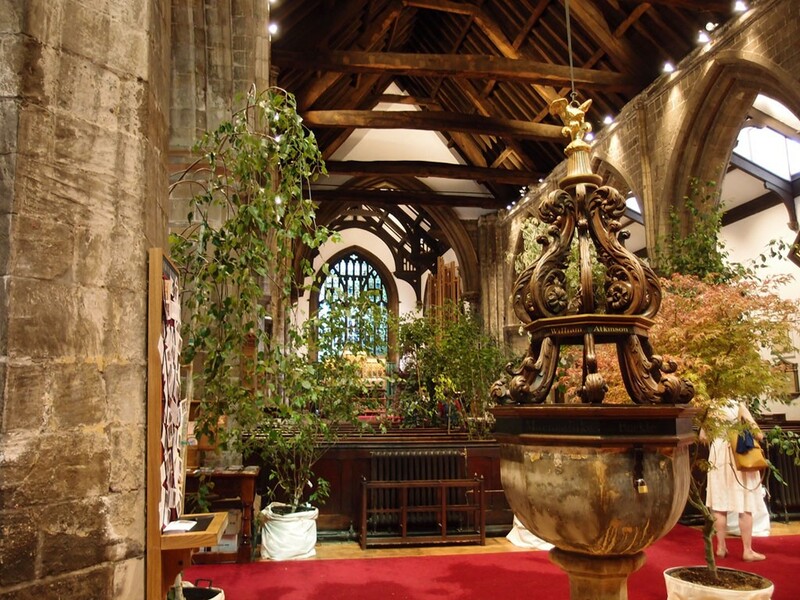 After dashing across York on a very hot afternoon earlier this month I particularly appreciated the coolness of Holy Trinity church on Micklegate, enhanced by the relaxing greenery of trees. A cool place for quiet contemplation, with trees in tubs and birdsong through the speakers. Beautiful. I didn’t get to see much of Bloom York, but what I saw was cheering and uplifting. Like Etty looking pretty, in Exhibition Square, adorned with flowers. 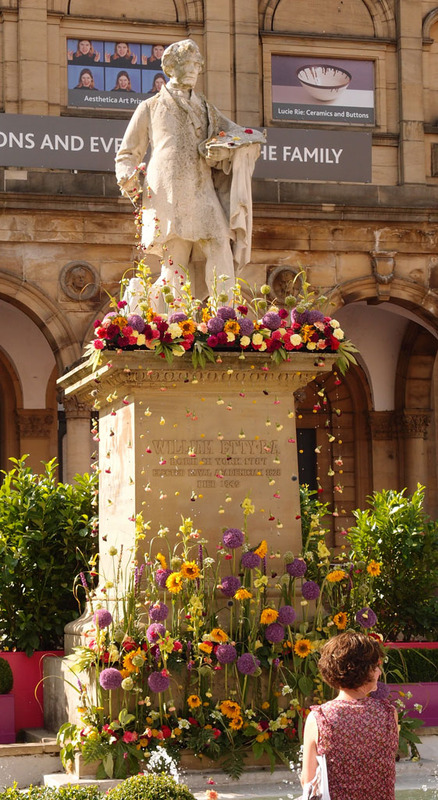 A fountain of flowers around the plinth, even some on the palette he’s holding. I’ve written about Etty and the fountain and Exhibition Square many times before. The square is often virtually deserted when I pass in the evenings, when the art gallery overlooking it is closed. 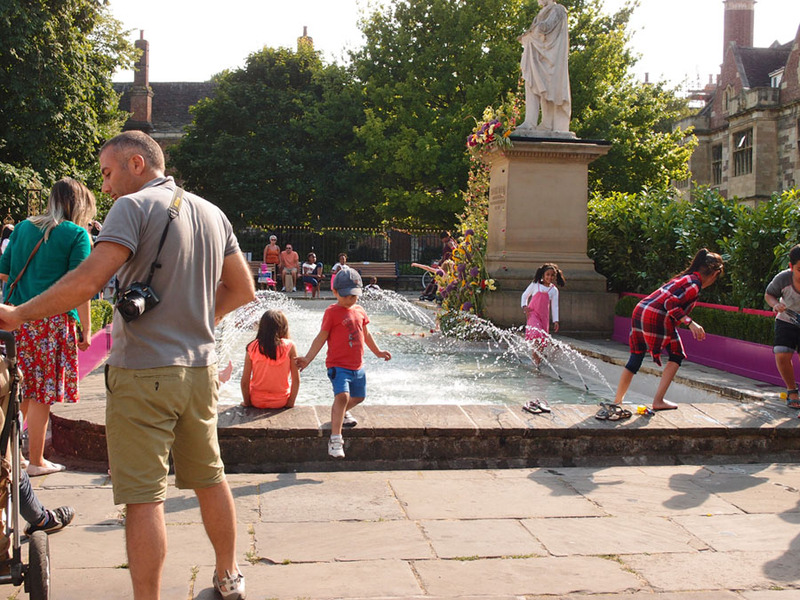 Quite a contrast to see it on this sunny Saturday afternoon, and good to see so many people enjoying the square, and particularly its fountain. As it was in 1971 so it is now, or at least on this particular sunny summer day in 2018. Not far away from Exhibition Square is Dean’s Park, where greenery and flowers can be enjoyed all year round. And, usually, it’s a nicely calm and quiet place. Not so quiet this summer though, as there’s a summer attraction occupying part of it. 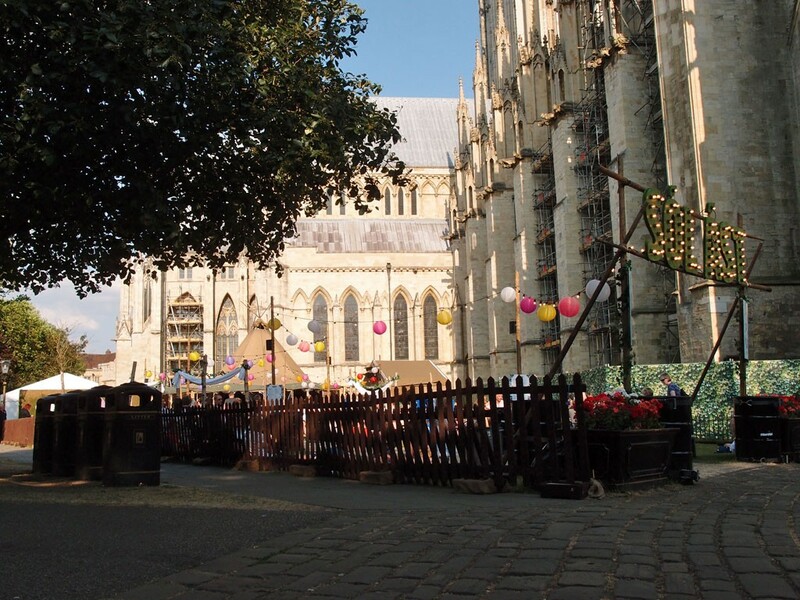 According to the York Minster website this new bar/restaurant is from the team behind Thor’s tipi bar, which I think is usually in Parliament Street at a different time of the year, (and, according to the York Minster website, it’s ‘legendary’). I sat on the grass outside the Sol Ast enclosure and observed its ambience. Clearly lots of people having a good time. The music from it rather clashed with the joyful exuberance of an excellent group of buskers performing within earshot in front of St Michael le Belfrey nearby. All very lively. Though I didn’t seem to be in the city centre at the right time to see and be shocked by all the stags and hens and general debauchery that I keep reading about in the local media. York is often these days described as ‘vibrant’, and seems particularly lively on summer weekends. I’ve not been feeling particularly vibrant, after a recent family bereavement and illness, and an earlier attempt to venture to the vibrancy of Piccadilly left me saying to my companion that it was all too vibrant for me and that I wanted to go home and sit in the garden. Some time later I revisited a site I’ve been following with interest for some years now, where the Spark:York development is now open. It’s certainly striking, as you approach from the junction with Merchantgate. What was perhaps the most interesting aspect was hearing the sound of voices, many voices, people chatting while sitting out in the sun on the first floor level above the street. So much activity, on a site where I can still remember the quiet dereliction and emptiness of the Reynard’s garage building. The opening of Spark:York hasn’t been universally welcomed, it’s fair to say. Yes, I’m choosing my words carefully and going for understatement rather than stoking things up further, as here on these pages we like to weigh things up and try to see everyone’s point of view. 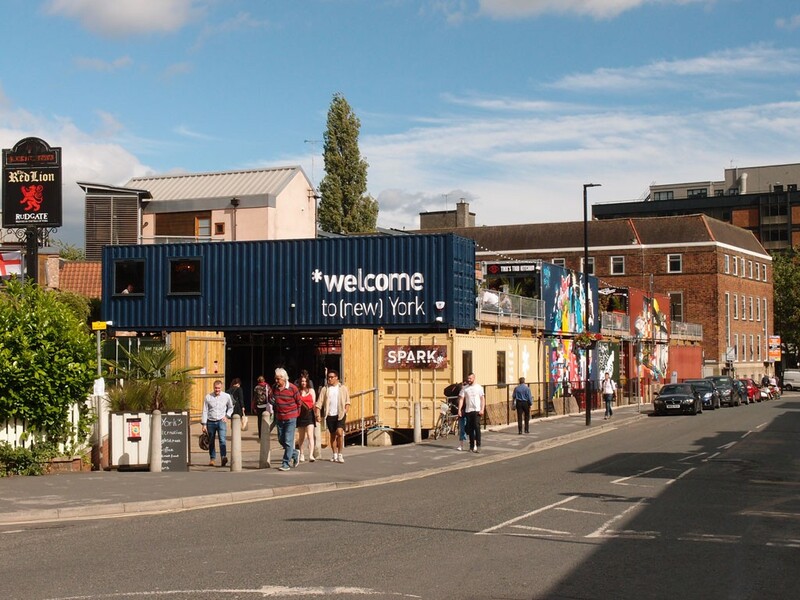 Of interest at present regarding the Spark:York site is a follow-up planning application, requesting the approval of the exterior, which isn’t quite as presented in the original planning application. 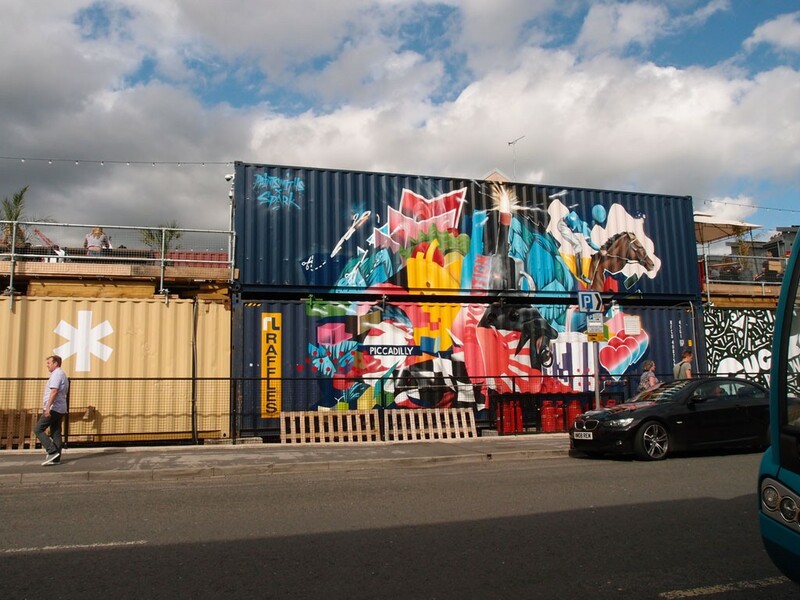 The shipping containers were supposed to be behind ‘soft timber cladding’, according to the earlier plans as approved. Instead there’s some graffiti art on the side. The Guildhall Planning Panel comments on the planning application note their disappointment that the result is ‘more edgy than originally proposed’. It may seem like a minor point but it does raise wider questions, all too complicated to go into on this page. Personally I’d rather valuable resources went into other things, rather than essentially pointless cladding to cover up some paint. But anyway, it seems that the matter is to be discussed and decided by the planning committee in August. Just a stone’s throw away, on the other side of the Foss, is the much-anticipated ‘Shakespeare’s Rose Theatre’, here for the summer on part of the Castle car park. 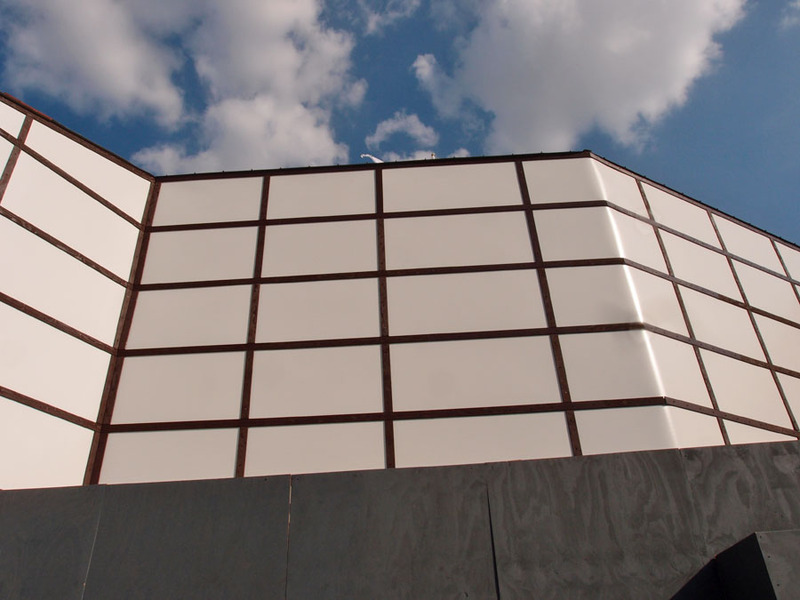 The side of the theatre structure looked a bit more shiny and modern than I was expecting, as I approached it from the riverside walkway by the Coppergate centre. Is this some cladding which I see before me? Perhaps it could be donated to Spark:York when the theatre is taken down. Inside here there’s what sounds like an impressive structure: ‘state-of-the-art scaffolding technology, corrugated iron and timber with the historic 13-sided design of a 16th century Shakespearean theatre’, says the website. Again, as on Piccadilly, what I noticed most was the noise, laughter and voices, happy people on a sunny afternoon. At Spark:York and at the Rose Theatre new structures had brought new life to these particular sites, in creative and interesting ways. Does it matter what the outside looks like? These things are only here for a while. Whereas some structures have been here for centuries, loved and cherished. I’ll end this page with a familiar building I’ve written about many times in the past. It has known many many summers, and this summer it’s overlooking the Rose Theatre’s temporary site in the car park below. 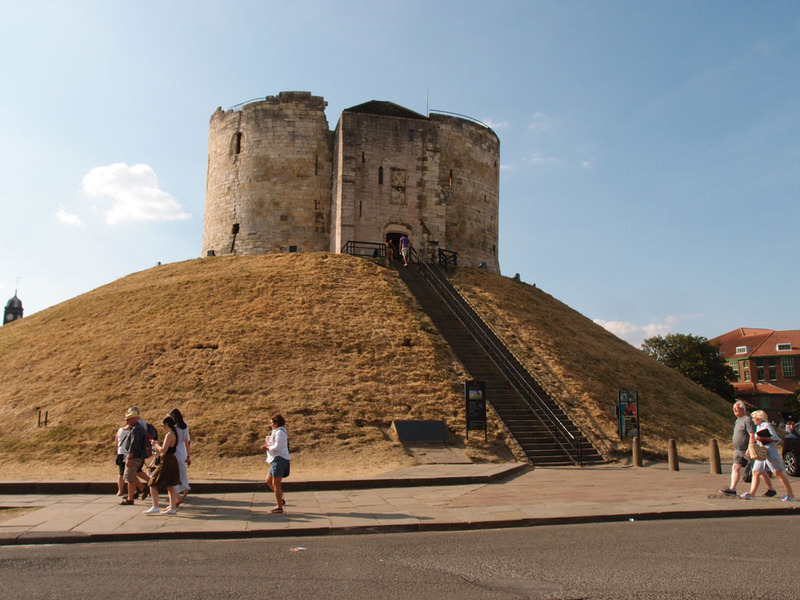 Clifford’s Tower, with its grassy mound all brown and dry from the summer’s heatwave. In recent months the controversial plan for a new visitor centre here at the foot of the steps has been abandoned, as I’m sure most readers know. It will be interesting to see what new plans come to light for this area. It would be good if they could better represent the complex histories of this castle site, and how its buildings are linked, and how it has been shaped over the centuries. So much happening in ‘vibrant’ York, and so much change and development, since I started this (my salad days, when I was green in judgement). Despite my recent rather long silence I’m still reading about many happenings — petitions and planning applications, demolitions and developments. It’s all very interesting and I’m sorry I’ve not had the time or the mental space to write much recently. I will do my best in terms of more regular content creation. Dear Lisa, I’ve only recently discovered your website.. i really like it.. I’ve been a York resident for many years… maybe not for much longer… but I would like to tell you of something I have been ‘gifting’ to York in the past two or three years….. I live near Bootham mental hospital and have for the past couple of years been scattering Forgetmenot seeds and Bluebell seeds in amongst the trees at the front of the site…. this year there was a lovely show of forgetmenots and bluebells and hopefully next year when i may not be living nearby there will be an even bigger show.It is my gift to York…. to counteract what seems to me the increasing mercenary nature of the city? Not our fault? But I wanted to give beauty and pretty flowers for people to see as they walked into town along Bootham. It heartens me. I hope it does you? best wishes, Maggie Barton. York’s Bloom! 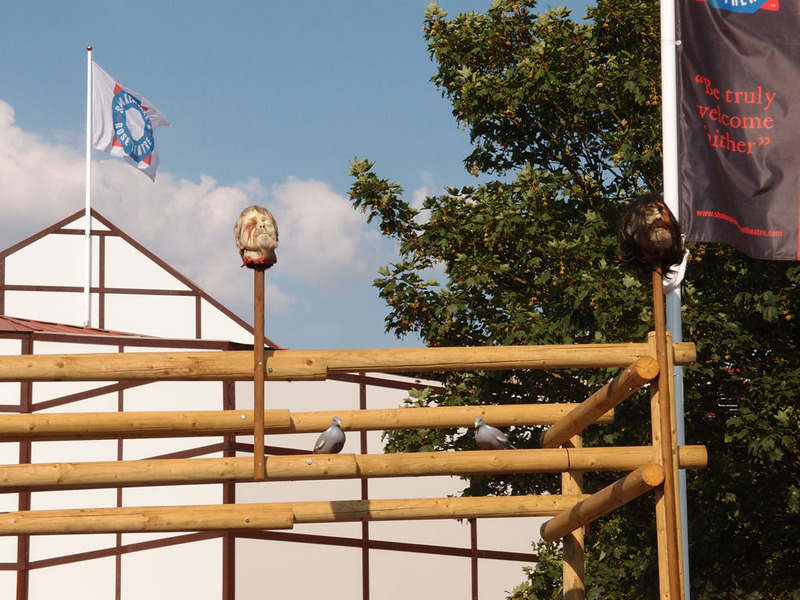 festival was a fascinating experience, with access to a number of places not normally open to the public as well as the brightening up of some public spaces. It was a very cheerful event, but what struck me most was the bleakness of the open spaces after the flowers and greenery were taken away. Exhibition Square in particular was wonderful with flowers but has now returned to it’s usual bleakness. I hope Bloom! is repeated next year, and that we might see more shrubs and flowers in our squares on a year round basis.